Today l want to write a great article which can help many people make money on their blog by turning their Blogger blog into a fully flourishing eCommerce store. It will help you to boost your online business. To achieve this looks tricky and hard but technology has made many things easy and we can achieve the turning of your blog to flourishing eCommerce store by using a plugin which l will give you below this article and also direct you on how to use it. I know their many custom templates which we can use to make our blog an eCommerce store but on this article l want to show you how to convert your already existing non eCommerce blog template to fully eCommerce store. When you successfully convert your blog site to an eCommerce store you can sell any product or services you want to sell on it. But you must make sure this products and services are related to your blog niche and are also relevant to your blog site visitors. If you have a written ebook you can also sell the ebook on your eCommerce blog site. Beside this, you can sell other products and services ranging from Fashion, T-shirts, skin products l, jewelry etc and any other products that are legal. 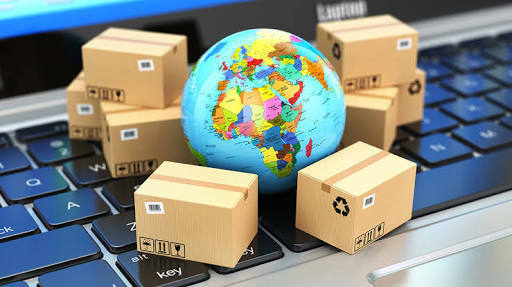 The eCommerce store can be created on many blogging platforms we have like WordPress, Joomla etc even social media like Faceboo etc and other platforms. But on this article am focusing on how to create an eCommerce store on Blogger Blogspot platform. 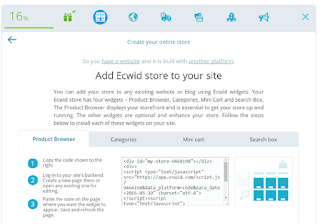 To add an online store to blogger Blogspot we are going to use a plugin called ECWID. ECWID is a free eCommerce shopping store solution and cart that helps bloggers to convert their existing blogs into a fully functional flourishing eCommerce store. How to convert your Bloggers blog into an online eCommerce store. Before we proceed you must, first of all, create an account on ECWID.com you can use your Google profile, Facebook or Paypal account to register. ✅ : The first step is to add a product after creating an account. You can access the Product dashboard or Ecwid Control Panel after creating your account and from there you can create your first product. Click on "Add a Product" button from the Top Menu and proceed to next step. 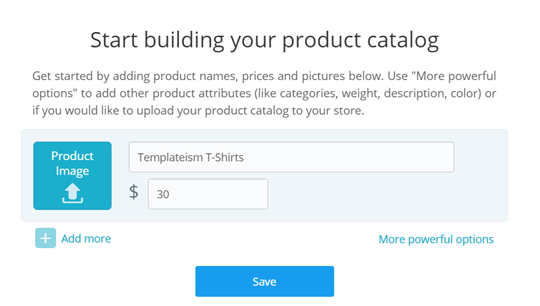 You create your first product by adding your product name, pictures and prices. Adding more details to our products will be handy because we will later upload our product catalog to our blog. After adding your product, click "Save". Note: there will be no product added successfully message. 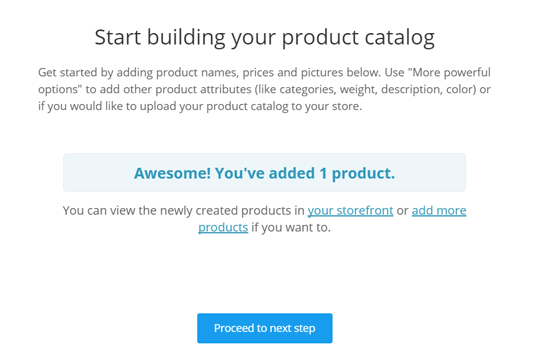 After adding your product and the details click on "Proceed to next step" button. 👉 Demo catalog on ECWID helps you to understand the functionality of the site and explore it. 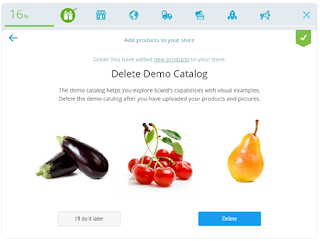 The demo catalog are pre-added products on your new account, they will ask you to delete it after watching it or not then click "Delete" to remove all demo products. This step is where you will have to create your own store after deleting the demo catalog. This will help you to publish your online store on your Blogger Blogspot. To do this click on "Create Store" from the top menu. Click "Yes” I have a website" button and move on to the next step. 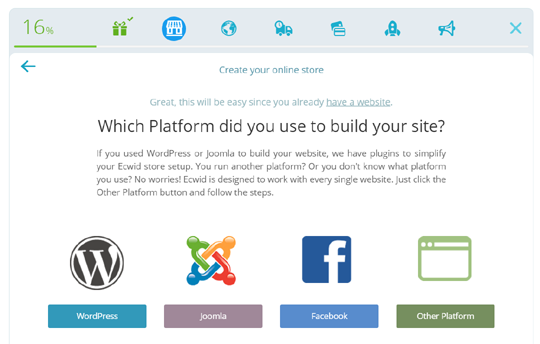 From this step, you will choose the platform which you used to build your website. But in this article, we are writing about Blogger but it's not listed on the available platforms then click "Other Platform". 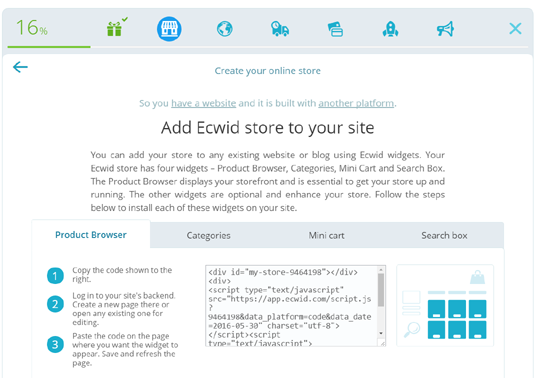 Ecwid has 4 different eCommerce widget that you can use to add an online store on your Blogger site. They are Product browser, Categories, Mini Cart and Search Box. Product browser: this widget display all the products you added to your Ecwid product catalog and its the most used and very essential widget to get your online store running while other widgets are optional to use them. 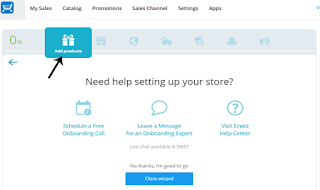 Categories: this widget helps to show a complete list of the Ecwid categories of your online store. Mini Cart: It will add a mini shopping cart to your site. Adding it to the menu will assist users in checkouts. Search Box: It helps users to search for different products on your Ecwid online store. 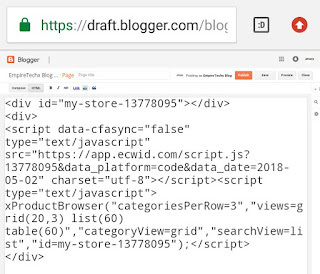 At this stage, an embed code of 4 different widgets that we listed above will be generated and made available for you to embed it on your Blogger blog. Then copy any of the 4 codes and paste it on the page on your blog where you want the online store to appear. To add Product browser widget in blogger follow this step. You can also see how to backup or restore your blogger template. 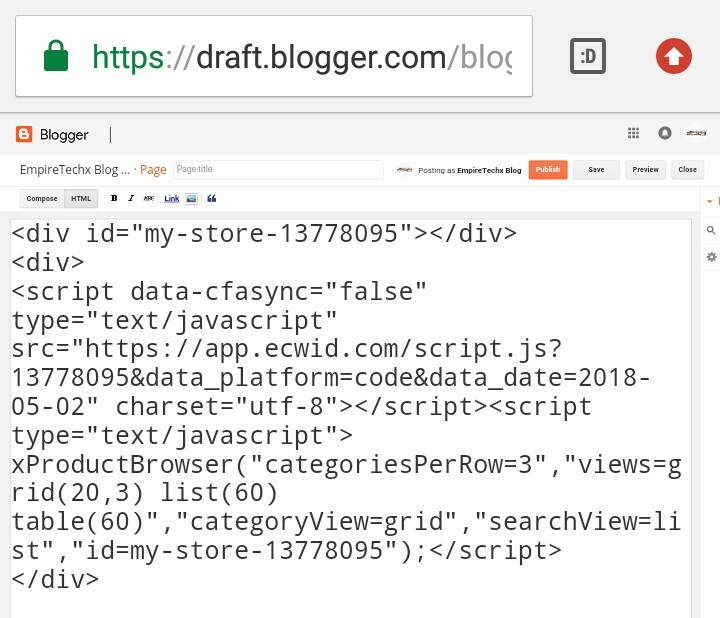 Copy the Product Browser embed code and go to Blogger.com >> Add a New Page. Then change to HTML Mode this is for inserting HTML code if it's on Compose the code won't work. Paste the Product Browser embed code you copied earlier. Give the page a name like "My Store" and click “Publish button”. You have finished this stage which is how to add an eCommerce store on your blogger. 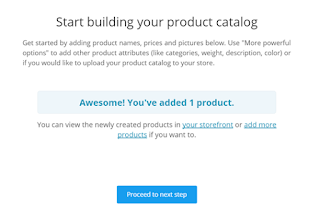 To add more product just go to your Ecwid dashboard and add any other product you like, any product added to your product catalog will appear automatically on the Product Browser in your blog. 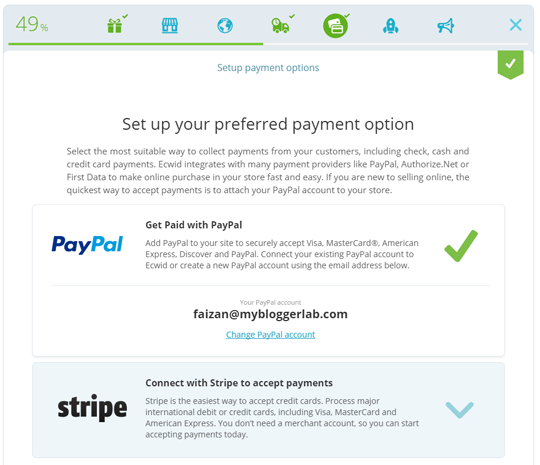 You have to set up your payment method. 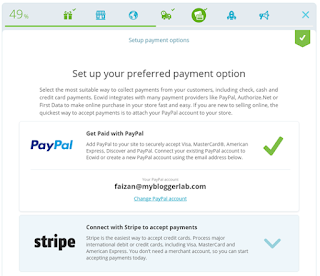 You can be paid on Ecwid using some popular payment method like PayPal, Stripe, and Authorize.net. Select the best suitable method of payment for you from your customers using either checks, credit card payments, cash etc. Click "get paid" from the top menu. Then set up your shipping method by clicking on "Configure Shipping" from the top menu. If the type of product you sell is digital products then disable shipping for products. But if you sell physical goods follow the instruction to set up your shipping methods. We hope this tutorial has helped you in learning how to create an online eCommerce Store in Blogger blog. If this article helped you share it with your friends and the public on Facebook, Google+, Twitter etc. Thanks.